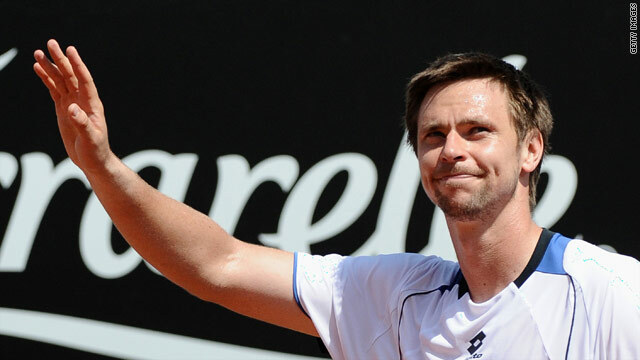 Robin Soderling cruised into the second round at Roland Garros, dropping just five games in three sets. (CNN) -- Fifth seed Robin Soderling showed that he is one of the favorites for overall victory at Roland Garros, dropping just five games one his way to a comfortable straight sets win on Sunday. The Swede, who sensationally beat Rafael Nadal last year on his way to the French Open final, reached the second round of this year's tournament after crushing French wildcard Laurent Recouderc 6-0 6-2 6-3 in just 90 minutes. "It is always nice to come back to a place where you did well last year -- it gives you good feelings," the 25-year-old told reporters after his triumph. Soderling will next face either American Taylor Dent or Ecuador's Nicolas Lapentti in the second round. There were no shocks in the men's draw on the opening day, although 10th seed Marin Cilic did drop a set on his way to a 6-1 3-6 6-3 6-1 success over Brazilian Ricardo Mello. Mikhail Youzhny, seeded 11, eased past Michal Przysiezny 6-1 6-0 6-4, while there were straight sets victories for Albert Montanes (seeded 29) and Guillermo Garcia-Lopez (32). But there was disappointment for dark horse Ernests Gulbis. The Latvian, who beat world number one Roger Federer in the Rome Masters earlier this year, was viewed by many as a dangerous outsider for the top names to fear. However, the 23rd seed had to retire with a hamstring injury while trailing 6-4 6-2 1-0 to France's Julien Benneteau.